Welcome to the P~P~S Success Wheel! There are 12 assessments, one for each lesson in the first year of Personal ~ Professional ~ Spiritual Success Mastery training. You may complete as few or as many of the questionnaires as you wish. For each questionnaire that you complete, your graph will indicate how much training you need in that P~P~S lesson to balance out your personal, professional, and spiritual development. Give yourself the best feedback by responding to the questions candidly and truthfully. 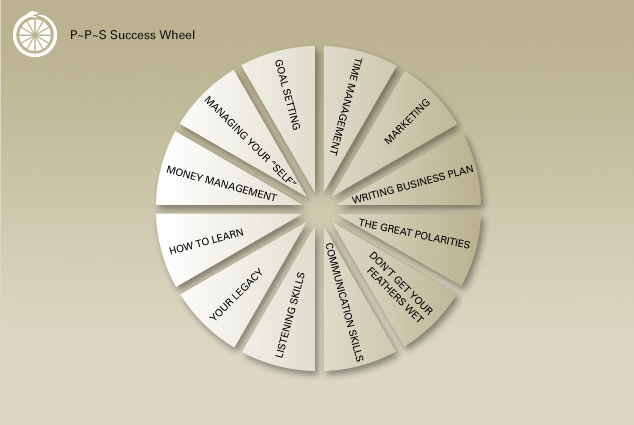 The ability of the Success Wheel to accurately reflect your current progress depends on it! Don’t answer the questions to be politically correct, polite, or to please another’s opinion; this information is just for you! When you complete the first assessment, click the submit button. You will see your results immediately. The more round your Success Wheel is, the better. Of course some portions may be less shapely. A big dent or a flat spot indicates those areas of the wheel that will be most critical to developing a balanced approach to achieving your goals. Complete all 12 assessments and give yourself the valuable feedback you need to improve your life. The Personal~ Professional ~ Spiritual Success Mastery program includes all 12 transformative lessons to help and support you in creating a perfectly round Success Wheel. That means the balance you need to succeed!